Importance. 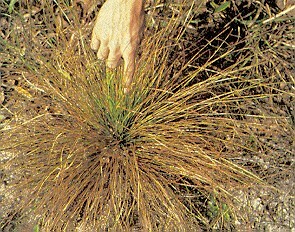 - Longleaf pine is the only species in the South that is damaged by this disease. 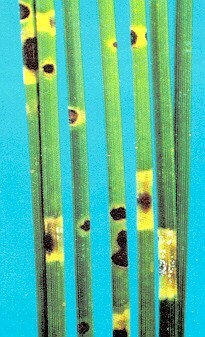 Seedlings are often heavily infected while in the grass stage and often die after repeated defoliations. Identifying the Fungus. - Boat-shaped spores are produced in the yellow bands on the needles. Positive identification can be made by examining the spores under a microscope. Identifying the Injury. - Infected needles develop grey-green spots, which later turn brown. Eventually, a yellow band develops on the needle. The affected area then increases in size, resulting in death of the needle. Biology. - Spores are released from the fruiting bodies (acervuli) on the needles throughout the year. The spores are splashed short distances by rain drops. During the winter and early spring, perithecia are produced on dead needles. Spores from these perithecia are responsible for longer distance spread of the fungus. Control. - Plant resistant or high-quality seedlings on intensively prepared sites. When seed trees are used, burn in the fall to destroy diseased needles. Where seedlings are established, burn during the dormant season. Remove seed trees when seedlings are 1 or 2 years old. Fungicide sprays are effective in controlling this disease in nurseries.